choir on their new music room. 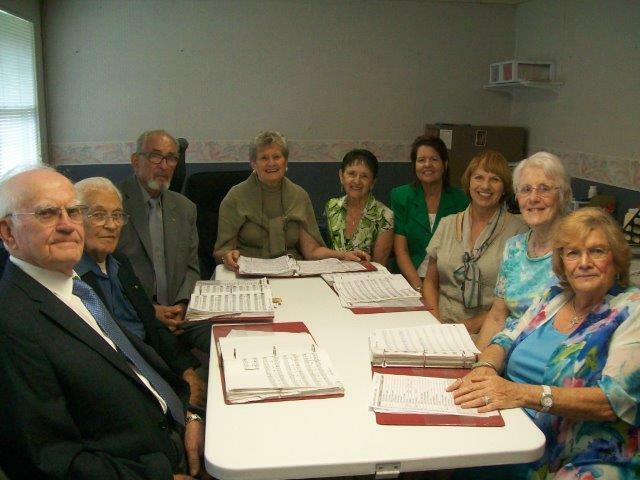 Dolores Lichatz, Nancy Kinley, Dorothy Raybin, Margaret Wagner, Nick Borick, Alek & Margaret Wereszczak, Andy Cuttic, Barbara Yacos, Elaine Costello, Rickcal Bullock, Barbara Brockman, Charles Kilgore. Music from: "Have Mercy on Me O God"
The texts of the propers sung at Vespers (stichera on "Lord I call," Litya, Aposticha, Troparia and Kontakia that change daily according to either the day of the week or particular day of the month). Texts are formatted in MS Word. Print these pages for your use in liturgical worship! A self-study tool that introduces the singer to the eight tones of Common (L’vov-Bakhmetev Obikhod) and Kievan Chant. Illustrates tonal patterns for singing stichera. Future sections will treat psalm verses,troparia, and kanons. The scheme of the tutorial is to break down each tone and identify each of its musical phrases. The sequence for the proper use of the melodic phrases is fully explained as well as the “formula” (intonation patter, recitation pitch of the body of the phrase, and cadence) for each melodic line. All phrases are illustrated with musical and textual examples. Recorded choral demonstrations of the written examples for each tone are presented, including full (SATB) choir, and individual lines for soprano, alto, tenor, and bass. Index of liturgical music for daily worship during the year. Exploring the Many Facets of Orthodox Liturgical Singing - A program devoted to exploring Orthodox liturgical singing and related topics. We will explore the theology of singing and Orthodox worship over the centuries, different types of hymns and genres, the origins and structures of various chant systems, and the various hymnographers and composers. Vladimir Morosan discusses the unusual "hymnographical vacuum" between the feasts of Ascension and Pentecost, and how the Church's "liturgical anticipation" is fulfilled by the return of certain hymns on the feast of Pentecost. Vladimir Morosan examines the manner in which the inimitable musical ethos of Orthodox Pascha (Easter) has expressed itself in different cultures and languages, in different epochs, and through a variety of musical styles. 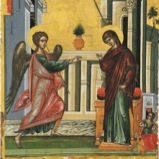 Vladimir Morosan takes the listener on a journey through the hymnography of the Great Feast of Annunciation, which teaches the faithful how to praise the Most Holy Theotokos through direct quotation and poetic paraphrase from the Scriptures. Vladimir Morosan discusses how the Church invites the faithful to enter into Great and Holy Lent through the hymnography of the Lenten Triodion, with special focus on the hymns of the pre-Lenten Sundays and the first week of Great Lent.